French Socialist presidential candidate Francois Hollande said he will "relentlessly fight against anti-Semitism” if elected Sunday. Hollande is expected to attract a plurality of votes but less than a majority in the contest featuring him and French President Nicolas Sarkozy. "I will be relentless in the fight against anti-Semitism. Security of Jews in France is not the problem of a particular community, it is that of the nation Socialist Party candidate Hollande in French al community," Hollande told a French Jewish newspaper last week. "It's not up to French Jews to defend themselves but rather to the Republic to protect them,” Hollande asserted, less than a month after a Muslim terrorist murdered a rabbi and three young children at a Jewish day school in Toulouse. Hollande said the murders were a “trauma for all of France” and he directly pointed to radical Islam as "the most direct source of new anti-Semitism.” He added, "We must strongly fight them… This fight is not that of one civilization against another, it is a war of barbarism against all civilizations." The participation of another 10 candidates is expected to prevent Holland or Sarkozy from winning the election in the first round. The second round, if necessary, will take place in two weeks. The economy, the rising tide of immigrants and the threat of radical Islam are all primary factors in the campaign. The global financial crisis three years ago has left Sarkozy largely to blame for France’s huge debt and struggling economy. Sarkozy has promised to cut immigration in half. 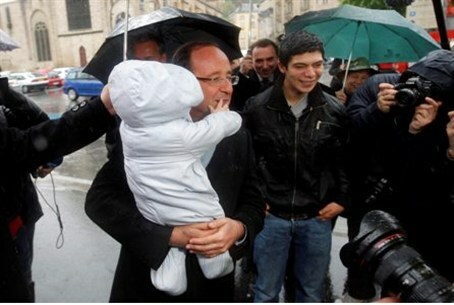 Hollande held up to a 10-plus percentage point lead over Sarkozy in pre-election polls. Sarkozy swept into power on a wave of enthusiasm in 2007, but now has a dismal one-third approval rating in the polls. A “spoil factor” in the first round could be far-right leader Marine LePen, whose support comes almost entirely from voters who otherwise would probably favor Sarkozy.